Democrat Richard Cordray's campaign for Ohio governor is using footage from the state government's television channel in an advertisement despite policy and law forbidding its use in such contexts. 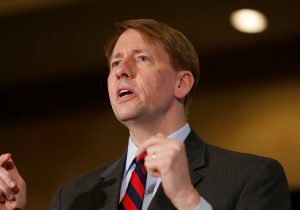 The footage is of Cordray, when he was the Ohio attorney general, announcing a drug bust in 2010, cleveland.com reports. The clip is three seconds long and was released on Saturday. However, state law and Ohio Channel policy forbid the practice. The 2001 law that created the channel states its footage cannot be used for such political reasons: "Services provided by the Ohio government telecommunications service shall not be used for political purposes included in campaign materials, or otherwise used to influence an election, legislation, issue, judicial decision, or other policy of state government." Ohio Channel Executive Director Dan Shellenbarger said in an interview with cleveland.com that campaigns usually comply with the Ohio Channel when requested to remove its footage. "Usually, they have the idea, and it's a mistaken idea, that it's public and that it's fair use, so it requires a little bit of education … on what is appropriate use and what is inappropriate," Shellenbarger said. The Cordray campaign, however, refuses to take down the ad, saying the law doesn't apply to archived footage available on the internet. Cordray's campaign also blamed Republican opponent Mike DeWine's campaign for complaining about their use of the footage instead of talking policy, despite DeWine holding a press conference Tuesday about his health care plans. "Republicans don't have any solutions for Ohioans facing increasing health insurance costs, prescription drug costs and stagnant wages — so they've resorted to complaining about footage in TV ads," Cordray campaign spokeswoman Christina Freundlich said. Shellenbarger said he reached out to Cordray's campaign to have a conversation about the footage.